Hello, fellow drone lovers! What a great Top 10 article we have here today! These are 10 of the most amazingly powerful high-budget drones on the market. As we all know by now, drone industry has developed at an astonishing rate. Four years ago we had very simple toy drones, right now in 2016 we have incredible aerial machinery available in the consumer market. If we expect to find the best quality and most innovative drones to date, well, you have come to the right place. Today’s Drones World article focus on the Top 10 Best Drones Under $1000, some of the best drone’s money can buy. Of course, as always, we bring you only the best value for your money, no flawed or outdated drones. As drone enthusiasts ourselves, we have researched and compared all the drones, within this budget, in the market. We have compiled a list of the best drones, and now we bring it to you. Without further due, let us take a deeper look into these amazing drones (sorted by price). Most likely you have already heard of Parrot drone manufacturer and their Parrot Bebop drone, one of the most successful drones in the market. Well, recently Parrot has upgraded their Bebop model. Thus I present Parrot Bebop 2! Bebop 2 is a very fun and easy to control camera drone, it has a built-in 14MP FPV (real time video transmission= camera capable of recording at 3072p 30fps. The camera also has a fish-eye lens with a 170º Field of View. Parrot Bebop 2 doesn’t make use of a 2.4 GHz controller. It actually uses your smartphone or tablet device as a controller. Control is done via a free application available for both Android and iOS. All the drone features are also available through the app, as well as the live video displayed the tablet’s screen. Features include Altitude Hold, Position Hold, Flight Planning (paid app feature), Autopilot, Follow Me, Automatic Landing, Return to Home. As you can Bebop 2, even though the cheapest drone on this top 10 list, it still includes a wide set of powerful and important features. Only negative side is that Flight Planning for autopilot function is a paid extra within the app. Parrot Bebop 2 has a maximum control range of 300 meters, but it can be boosted up to 2000 meters if you purchase (separately) Parrot’s Skycontroller. For more information, related to Parrot Bebop 2 check our full article. 3DR Solo is developed by the American company 3D Robotics, the same manufacturer of 3DR Iris+. 3DR Solo is 3D Robotic’s affordable competitor of the DJI Phantom 3 series. Solo, is ideal for videography and photography. Totally compatible with GoPro cameras and Sony R10C camera. Ready to fly out of the box, 3DR Solo combines ease of use with aerial video flight modes, therefore if you are looking for a smart drone to use together with your GoPro, you have found it. 3DR Solo features Linear tracking shots (Cable Cam), Orbit Mode, Selfie Mode, Follow Me Mode, Automatic Landing, Take Off and Automatic Return to Home, Altitude Hold, and Geofacing protection. 3DR Solo comes with a gaming style 2.4 Ghz controller with a holder for you to place your tablet or smartphone (on which you can display live video), but can also be entirely controlled via Android and iOS device too. Solo comes with a lot of useful and entertaining features for camera lovers; you will be able to record high-quality footage without any hassle. If you were a fan of Ehang Ghostdrone you would love even more the new Ehang Ghostdrone 2.0, a drone entirely controlled by your phone; it even mimics the phone’s movement. Are you a beginner? Keep reading, and this might just be the affordable best drone under $1000 which you have been looking for. It is said to be one of the easiest to control drones out there in the market, mainly due to its Smart Flight features and Android and iOS device remote control. Even though Ghostdrone 2 is one of the cheapest high-budget drones, it still includes a 4K camera, and a 3-axis stabilized gimbal (compatible with GoPro cameras as well). Therefore, expect high-quality image, ensuring amazing video footage and photographs. As previously mentioned, Ghostdrone 2.0 is controlled by the smartphone, via the free EHANG Play App, this app displays live video being recorded from the camera and gives access to the drone features. These features are Waypoint Mode, Follow Me Mode, Companion Mode, Avatar Mode, Flight Planning Mode, Auto-Return (also when the battery is low, automatically returns to pilot safely), Automatic Landing, Auto Take-off, VR (Virtual Reality) glasses compatibility. Ehang Ghostdrone has a maximum control range of 1000 meters (average range considering its price) and 25 minutes flight time (slightly above average). If you are looking for a great drone similar to DJI products but want to invest less money, Ehang Ghostdrone 2.0 is their most affordable and capable competitor. Yuneec is a very well-known drone manufacturer among drone enthusiasts, and they have released beautifully designed drones into the market. Q500+ is the upgraded version of the older model Q500. Yuneec Q500+ is a vast and slow drone, expressly aimed at recording video and taking photographs. Q500+ features a set of useful functions to enhance image capturing. It comes with a Full HD 1080p 16MP 60FPS camera with a 130º Field of View and a 3-Axis stabilized gimbal. It also displays live video directly to the 5.5 LCD Touch-Screen FPV (real time video transmission) screen built-in on the 2.4 Ghz remote controller. Yuneec Q500+ has three flight modes which make use of the internal GPS: Smart Mode, Angle Mode, and Home Mode. Q500+ is not the best fit for beginners, but more experienced pilots will find these flight modes very useful when recording video. Q500+ also features Geofence Protection, Altitude Hold, Position Hold, Flight Planning, Follow Me, Automatic Landing and Return to Home. Yuneec Q500+ has a somewhat small range of only 800 meters and a flight time of 20 to 25 minutes. DJI is the most renowned drone manufacturer among drone enthusiasts, at least at the moment. They keep releasing great quadcopters one after the other. An excellent example of this is the Phantom series, while the latest Phantom is the fourth (Phantom 4), their previous 3 series was also amazingly impactful in the market. In fact, we have reserved two spots in this top 10 list for two versions of the Phantom 3 series. In sixth place, we have DJI Phantom 3 Advanced! Firstly, it is important to mention that Phantom 3 series represented the first time DJI did not use a GoPro. Instead, they introduced their own competitor of the popular action camera. Phantom 3 Advanced comes with the 2.7K 12MP camera version manufactured by DJI itself plus a 3-Axis Stabilized Gimbal. Record astonishing footage with one of the most autonomous drones in the market. Phantom 3 features powerful functions that actually enhance the quadcopter’s capabilities. These features are GPS and GLONASS dual positioning system, Vision Positioning System, Auto-Takeoff, Return to Home (also when the battery runs low it automatically returns to pilot), Follow Me, Point of Interest, Waypoints, Course Lock, Home Lock and visual and ultrasonic sensors. On top of all these amazing smart features, Phantom 3 has a maximum control range of up to 5Km and 23 minutes flight time. DJI Phantom 3 transmits live video in high-quality directly to your tablet device which can be placed on DJI’s remote controller, the app is available for both Android and iOS. Walkera Scout X4 is not a very new drone. However, it is still one of the best drones in the market, and it’s a must on this list. Scout X4 can take the form of a quadcopter or octocopter (8 motors). Scout X4 can carry heavy objects and cameras due to its powerful engines, and if you use the 8 motors instead of 4, as expected the payload capacity increases a lot. Scout X4 has a unique waypoint mapping feature which allows the pilot to program a flight route (Flight Planning feature) for the quadcopter by just tapping the destinations on his smartphone or tablet touch screen. Other features include Follow Me mode, Altitude Hold, Return to Home and Automatic Landing. Scout X4 is the ideal drone to explore the wild and the area around you, which explains the name “Scout,” the drone uses GPS coordinates to be continuously aware of its position. Walkera Scout X4 includes a 3D gimbal compatible with GoPro cameras, but it also includes its own iLook+ camera with 720p resolution and 30 FPS. Scout X4 makes use of the powerful Devo F12E FPV Transmitter, which enables real-time video to be displayed on its built-in screen. Scout X4 has a decent control range of 1500 meters and a flight time of 25 minutes. Scout X4 is definitely Walkera’s best drone to record and explore the outdoors. Most likely you have never heard of Autel Robotics, but you are about to. They are a USA based company, formed by a team of drone industry professionals with a huge passion for drones. In the past, they have released X-Star quadcopter, a decent quality drone with a lot to offer. They have now upgraded it, releasing the X-Star Premium, an amazing and powerful, affordable quadcopter with a 4k camera. In fact, X-Star Premium aims to be one of the most affordable camera drones in the market, excelling in camera quality and autopilot functions that power the quadcopter. The 4K camera (with a 108º Field of View) is integrated with a 3-axis stabilized gimbal, and it can record Ultra HD videos or take 12 MP photos with an astonishing image quality. X-Star Premium also has an extensive set of features which truly enhance the quadcopter. These features are Precision Positioning via Dual Satellite Navigation and Starpoint Positioning System; Dual GPS and GLONASS; Intelligent Flight functions such as Follow Me, Orbit and Waypoints (autopilot); Geo-Fence protection (limits range and speed, mainly useful for beginners to practice). X-Star Premium remote controller is very simple to use and includes a tablet or phone holder for you to place your device. You can connect your smart device to the quadcopter via WiFi and watch in real time what the camera is recording. This is done through a free app available for both Android and iOS. The app also allows the pilot to take photos, record video, access features, watch live map with quad’s real position, etc. X-Star Premium has a maximum control range of 2000 meters and a flight time around 25 minutes. Without a doubt, X-Star Premium is one of the best and most affordable direct rivals of the DJI Phantom 3. Since we already discussed Phantom 3 Advanced, it is only important to mention the main difference between Professional and Advanced version, and that is the camera. While Phantom 3 Advanced comes with a 2.7K camera, Phantom 3 Professional comes with a 4K 12.4MP camera instead. Phantom 3 Professional also includes a range and FPV extender. Besides this, all of the rest remains the same. Therefore, if you are not looking for 4K image quality, Phantom 3 Advanced will suit you well for less money. However, if you are seeking a top notch camera, go with Professional. Yes, it’s true, GoPro has manufactured their own drone. After all these years, of drone manufacturers producing products (such as drones, gimbals, mounts) targeting the renowned GoPro cameras; GoPro released their own drone! Launched on the market very recently, as you should expect. Indeed it is a drone aimed at camera quality, durability, ease of use and outdoor sports and activities. GoPro Karma drone is available with or without a GoPro. Therefore if you already own a GoPro Hero 4 camera, you don’t need to buy the camera bundle (it’s not compatible with Hero 1, 2 and 3). However, with the newest release of GoPro Hero 5, you may want to buy the bundle with the Hero 5 included. This being said, let’s discuss the specifications and features of this quadcopter. First of all, it can be folded, perfectly fitting a backpack (included in the package), ideal to carry around. So let’s say if you hike, race, practice any sports, or just travel a lot, you will find that GoPro Karma is amazingly easy to transport, it is foldable and very lightweight. The camera is placed on a 3-axis gimbal which is put on the drone (detachable), allowing for steady 4K video and photos. GoPro Karma can fly as high as 4500 meters, as a range length of 1Km and as a flight time of 20 minutes. GoPro Karma has a flying speed of 16 meters per second (35 miles per hour). Karma lacks Smart Features but includes Altitude Hold, Position Hold, Automatic Landing and Return to Home. GoPro Karma is controlled via a particular controller produced by GoPro too, remote has a gaming design, 5” Touch display screen for FPV (real time video transmission) and it’s incredibly simple to use. Check the table below for more info. One of the top drone manufacturers in the market, one of our personal favorites. Without a doubt DJI is the most talked about drone brand at this moment, consistently releasing amazing products in the market. Well, they have done it once again, DJI Mavic Pro is their latest product, an extraordinary combination of mobility and camera quality. Mavic Pro is the direct rival of the GoPro Karma, both aimed at the outdoors activity. If you are looking for an easy to transport drone, it doesn’t get better than DJI Mavic Pro. A small and ultra-portable quadcopter, arms and propellers can be folded in, and the drone acquires the perfect size to fit a small backpack. Mavic Pro is a powerful drone, ready to fly right out of the box and all you need to fly FPV (real time video transmission). What do we mean by powerful? Well, Mavic Pro has 24 high-performance computing cores, an all-new communication system with 7km range (yes you read it well, 7000 meters! ), 4 vision sensors and of course a 4K camera stabilized by a 3-axis mechanical gimbal. The live video is displayed on the FPV screen built-in on DJI’s remote controller. 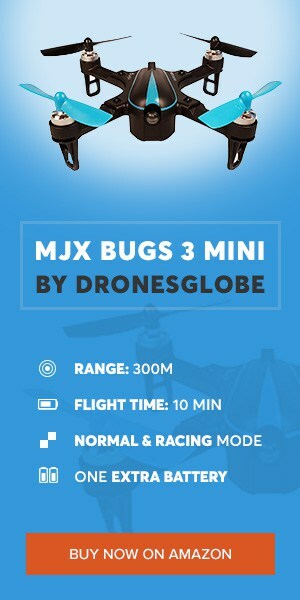 Therefore you can watch in real time without any hassle whatever the drone is recording from miles/kilometers away. DJI Mavic Pro excels in ease of use; you don’t have to be an expert pilot to fly it, not only it features smart-flight functions (which we will discuss in a minute) but also includes a very simple and easy to use DJI remote controller. It is important to mention the hovering power of this quadcopter, most drones use a GPS system to hover efficiently, Mavic Pro hovers perfectly without the need of a GPS, even indoors. DJI Mavic Pro features include: FlightAutonomy (senses and avoids obstacles), Automatic Landing, ActiveTrack Trace (follows target from behind, in front or in circles around it), Profile (fly alongside target), Spotlight (focus on target while you fly it manually), Gesture Mode (take photos with a hand gesture), Altitude Hold, Tap and Fly, GPS, Auto-Pilot, Return to Home. On top of all this amazingly powerful and useful features DJI Mavic Pro is also compatible with VR (Virtual reality) glasses and can be controlled via smartphone (available for Android and iOS). As you can tell, without a doubt, DJI Mavic Pro is one of the newest drones packing the most up-to-date hardware and software. You won’t regret owning this astonishing piece of drone technology. What did you think of our Top 10 best drones under $1000 list? Did you find the drone that best fits your needs? Let us know in the comment section below, we at Drones World love to read your comments and discuss drones with you. Don’t forget to bookmark this page and send it to any of your friends looking a best drone under $1000. Happy flying fellow drone lovers!